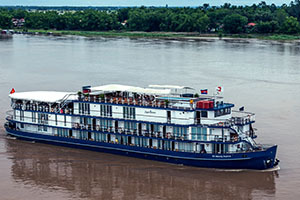 Be ready at hotel by 7.30amThe boat sets sail to cruise into the Bay. Find yourself getting acquainted with the facilities on board. A delectable buffet lunch with a feast of choices is served in the restaurant. Savor your first hours in Halong Bay on the sun deck by simply letting your eyes wander around the scenery. We arrive at the area of Cua Van, a floating fishing village. From here we start to explore a cave, named Tien Ong, and the floating fishing village. Tien Ong is the most recently explored cavem, Showing evidence of human civilization dating back to 10,000 – 8,000 BC. The cave is just 5 meters above sea level, 50 meters deep and covers 1,000 square meters. Our guide takes you on a loop though the cave and explains about the historical findings and the cave’s particulars. The voyage continues to the fishing village. With a small bamboo boat rowed by the local people we move around in the calm sea of this secluded area and gain an insight into the village life. You can also paddle by yourself in a kayak, which is a perfect way to freely move around in the calm area and experience the village life. After returning to the boat we sail to the overnight mooring area Luon Bo. 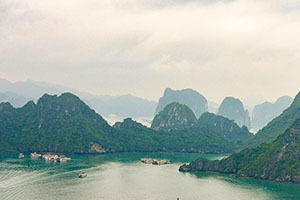 During this time Halong Bay reveals its most magnificent beauty – called the “blue hour”. Rewind on the sun deck with a drink of your choice and let this moment sink in. During sailing, our chef demonstrates the preparation of particular Vietnamese dishes. Feel free to join and practice by yourself. Dinner is served in the restaurant either à la carte or buffet style. Afterwards the night is yours to kick back and abundantly enjoy these unique moments amidst a surreal landscape. 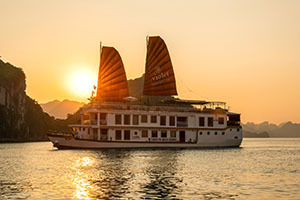 A presentation with interesting facts and insights on Halong Bay is also offered after dinner in the dining area. We wish you a good night in Halong Bay, where once upon a time dragons played with sparkling jewels. Overnight in the cruise. For early risers (around 6:30 am) tea, coffee and pastries are available in the dining room. A Tai Chi class is offered on the sundeck to ease mind and muscles. The boat sails to Ti Top Island. By tender boat we arrive at this little landmass in the Bay. Prepare yourself for a refreshing morning swim on a sandy beach beneath high rock formations. If you prefer to be more active, climb up to the hill to the top of Ti Top Island from where you have stunning views over Halong Bay. It takes 400 stone steps up and about 20 minutes to the top, minimal fitness and proper footwear is required. There is also a viewing platform about half-way up with great panoramic views. Back on board (around 8:45 am) you may like to shower and freshen up. Enjoy the last sailing time back to the harbor. A full breakfast is served in the dining room. Relax on the sun deck or in the dining room while savoring the last cruise moments of this iconic site before arriving back on shore. Our crew bids a fond farewell and helps with your belongings. Heritage Line and all the crew members thank you very much for having you on board. Meet our awaiting bus then transfers directly to your hotel in Hanoi. 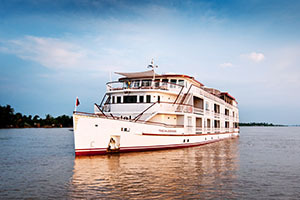 Accommodation, daily (group) shore-excursions as mentioned in the program, entrance fees, transportation as mentioned in the program, tour guide services (English speaking), taxes, fuel, river pilots, local anchorage and port fee, round trip transfer from/back to Hanoi (shuttle bus), breakfast (brunch), lunch, dinner, welcome drink, Tai Chi morning class, insurance (passenger liability), drinking water in cabin & during excursion, gym & sauna (in Violet Cruise only). 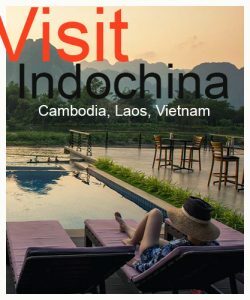 Crew and guide gratuities, any visa fees, private road and boat transfers, personal expenses/purchases, additional beverages, other services not mentioned in program or under inclusion, fuel surcharges (please refer to terms & conditions), kayaking ($15/pax for double seated kayak only), medical services, spa treatment and telephone.